Are we talking about this photo? It has been shown before. Here’s a side by side comparison based on Intercytex’s PDF file. Intercytex may be creating NEW follicles after all. This would be huge if that is the case. on the photo it looks to me that most of the new hair clearly grow from the old locations / pores. I hope that in march next year they will release some clear data. The percentages of vellous hair mean nothing to me. 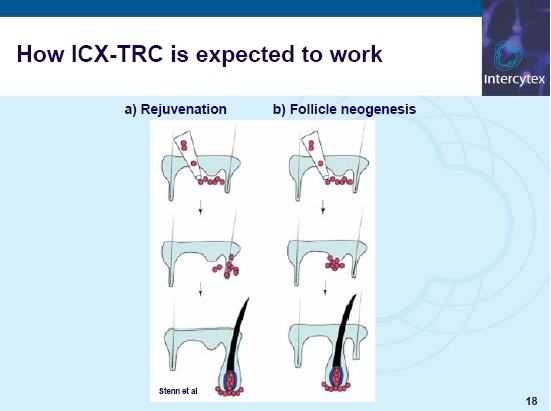 It’s a BIG deal whether the ICX-TRC method is really generating totally new follicles or not. The long-term implications of that issue are huge even if the effects on TRC’s current first-generation work are small. » old locations / pores. They don’t really tell us what those pictures represent. For all we know these could be two “after” shots of two different patients. » » old locations / pores. » these could be two “after” shots of two different patients. That would be silly. It is cleary a before and after comparison, that’s why they have the two tattoo dots there as a marker. It appears so, if you interpret the picture on the right the same as I do. Either way I think whatever they come up with will be a fantastic development in the treatment of MPB. If they roll out a procedure HM 1.0 in 2010-11, HM 2.0 should be only a few years behind and that may be the stand alone procedure we all want to see. » huge if that is the case. » why they have the two tattoo dots there as a marker. Look just to the left of the lower tattoo in the photo on the right. You’ll see a small mole that is not there in the first photo. Also of note, the photo on the right looks to be taken further along in the trial as the skin has healed and the ink has absorbed into the surrounding tissue. Interesting, I see a slight amount of scarring in each photo. I wonder if that has to do with the pre-stimulation technique? I suspect the redness in the left photo has to do with pre-stimulation of the epidermis. I’m uncertain if this is a true before and after image. That would be a good question for Kemp. » » why they have the two tattoo dots there as a marker. » Look just to the left of the lower tattoo in the photo on the right. » You’ll see a small mole that is not there in the first photo. If you look closely you’ll find it there. it’s barely visible but it’s there. 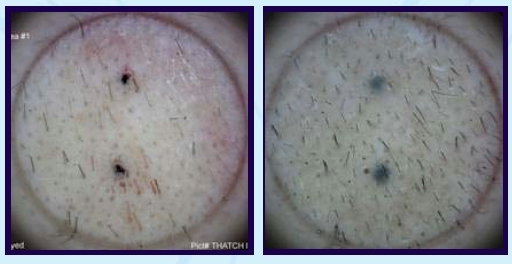 » in the left photo has to do with pre-stimulation of the epidermis. The photos are taken before the second cohort who had the pre-stimulation of the epidermis. If you read next to the picture it says “First cohort enrolled, 6 patients treated”. Therefor the photo could only be from the first cohort or phase 1. Also remeber that the first cohort had only two responders who had about 20 and 50 percent increase of hair. If the photos are before and after, which I think, it is unlikely that it is from phase 2 since the regrowth is clearly larger than 50%. » » » old locations / pores. » » these could be two “after” shots of two different patients. I agree that it would be silly, but so would stating regrowth percentages without defining the baseline, as ICX did in their trial II reports. If these pictures are indeed before and after, then IMHO the after picture looks little more than existing hair growing out. Neither the percentages, nor the pictures are very satisfactory. I just call 'em as I see 'em. Amilcar, You just hit upon the issue that is bugging me about HTs and HM these days. I think it’s a very big deal whether the current form of HM can generate all-new follicles or if it can only revive existing ones. This generic statement of: “HTs will not conflict with HM” does not cover it as far as I’m concerned. They haven’t figured out whether there are actually any new follicles being grown by the TRC method yet. And I personally think it makes a lot of sense that they might only be reviving existing ones. Making a follicle from scratch is a very challenging business. It’s almost like growing an entire new organ on someone. » new follicles being grown by the TRC method yet. Anyway now I’m thinking about topical finesteride…what do u think ? » » in the left photo has to do with pre-stimulation of the epidermis. » first cohort or phase 1. » is clearly larger than 50%. Yes, good points. I wasn’t paying that much attention to the origin of the photos but do recall seeing them before. Since the photos are from phase I, the wounds in the left photo seem very strange to me. Or is that just blood-soaked hair I am seeing? According to the present invention there is provided a method for inducing hair follicle formation in a dermal layer lying beneath an outer skin surface, comprising delivering inductive dermal sheath cells and/or inductive dermal papilla cells directly into the dermal layer using a controlled delivery device. A growing hair follicle will not necessarily automatically orientate itself properly. According to the invention the inductive dermal sheath cells and/or inductive dermal papilla cells may be delivered in a track (or channel) formed by the controlled delivery device and oriented towards an outer surface. The track may be contiguous with the host epidermis. A track provides a pathway which allows a nascent hair follicle to grow in the correct direction towards the surface of the skin and connect with the surface epidermis surrounding the track. In addition, the angle of the track can be varied, allowing the nascent hair follicle to grow at an appropriate angle relative to the outer surface. This achieves a good cosmetic result because hair follicles grow at different angles in different regions of the scalp and a more robust hair follicle. In one embodiment, the controlled delivery device used to generate the track has a needle with blunt end and an orifice on the lateral side near the tip (for example, an orifice approximately 0.5 mm from the tip), allowing cells to be implanted along the needle track. . . .